Saboten Con - DISTANT WORLDS RETURNS TO PHOENIX! Mar 21st 2019 09:14 PM|DISTANT WORLDS RETURNS TO PHOENIX! 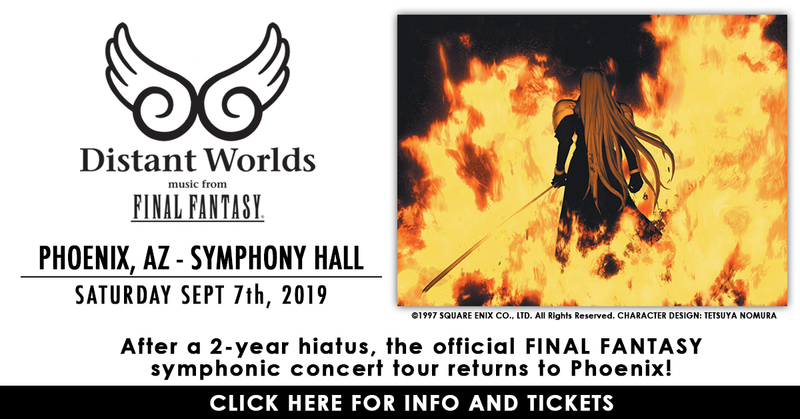 Returning to Phoenix after a 2-year hiatus, these concerts will include a special tribute to the original FINAL FANTASY VII, plus special guests RIKKI, original vocalist of FINAL FANTASY X, in her Phoenix premiere performance of “Suteki da ne” from FINAL FANTASY X, and Susan Calloway, original vocalist of FINAL FANTASY XIV. Don’t miss this jam-packed program, celebrating the original FINAL FANTASY VII! Distant Worlds features the music of the great video game series FINAL FANTASY and composer Nobuo Uematsu. The concerts are performed by symphony orchestra, choir, and renowned vocal and instrumental soloists, under the direction of GRAMMY Award-winner and acclaimed conductor Arnie Roth, with HD video presentations from the FINAL FANTASY game developers SQUARE ENIX projected onto giant screens throughout the concerts. Exclusive VIP Tickets Available: VIP ticket-holders will meet conductor Arnie Roth and vocalists RIKKI and Susan Calloway after the concert. Guests can have an item autographed and will have a photo opportunity. Tickets are limited!